It is recommended that you select a crank length near the middle of the range suggested the first time through Accufit. 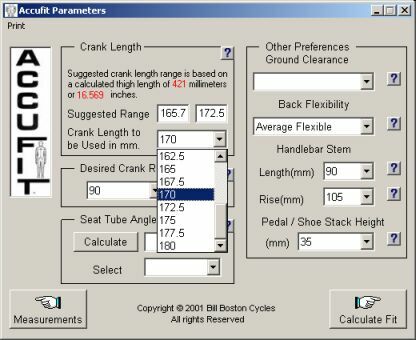 If you do not plan to use that size, return to this form and select the size that you will actually be using, then recalculate the seat tube angle and the fit before moving to the bike setup section. Additional information on crank length is available in the main help file.